For Ryan, I made a wooden cube puzzle set with 6 photos from his year. I bought a set of 24 wooden cubes at the craft shop and found an unfinished wooden box that would hold the blocks in a 4X6 configuration. I then used a rubber band to hold the blocks together and used decopage glue to glue a photo across the top of the blocks. When the glue dried I used a craft knife to cut the photo along each crack, freeing the blocks to separate. After trimming the ragged edges, I added several coats of glue, sanding and staining the edges between each coat. When one side was completed, I turned to the next, attaching a second photo, etc. I put a 7th photo on the cover of the box, coated it with glue, and added trim to finish it off. 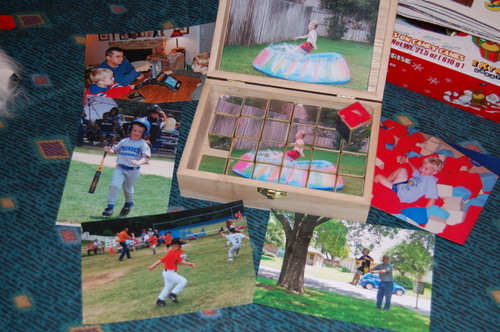 Loose copies of the 6 photos are in the top of the box to help the kids assemble the puzzles.